Finishes can separate into their components if they sit in the can for too long. Inadequate mixing can result in applying only some of the components of the finish, which fail to form a uniform film. Contaminants on the flooring, particularly paste wax that has seeped into the joints and been re-dissolved by the finish’s solvents, can also cause crawling. Small areas can be scraped and touched in. Larger areas may require screening the floor or sanding to bare wood. 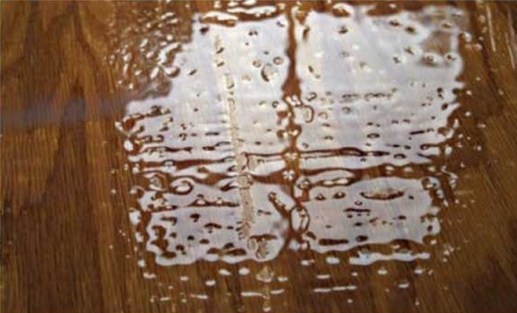 If contaminants are suspected, seal the sanded floor with a shellac or water-based sealer so as not to dissolve the wax. There is no guarantee that even this will work.